Indian equity markets lost further momentum in the afternoon session and closed on a weak note on the back of heavy selling in metal, PSU, auto and banking stocks amid weak European cues. 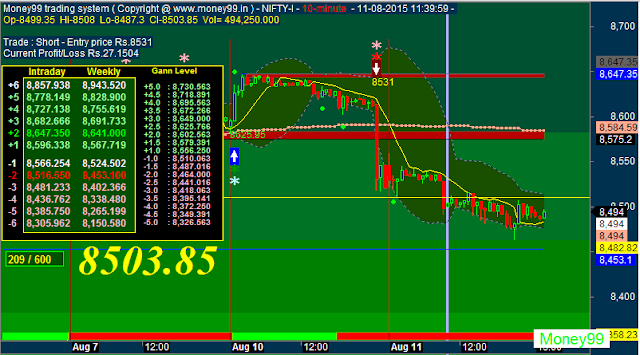 While, BSE Sensex lost steam and closed down sharply by 236 points, the NSE-Nifty too was seen down by 59 points. Midcaps and Small caps weren't spared either. The BSE Mid Cap was down by 0.5%, while BSE Small Cap was down by 1.1%. IT stocks ended the day with moderate gains. NSENIFTY closed down -63.250 at 8,462.350. Volume was 8% above average (neutral) and Bollinger Bands were 38% narrower than normal. NSENIFTY is currently 0.2% above its 200-period moving average and is in an downward trend. Volatility is low as compared to the average volatility over the last 10 periods. Our volume indicators reflect volume flowing into and out of NSENIFTY at a relatively equal pace (neutral). Our trend forecasting oscillators are currently bearish on NSENIFTY and have had this outlook for the last 5 periods. Asian markets finished lower today with shares in Japan leading the region. The Nikkei 225 is down 0.42%, while Hong Kong's Hang Seng is off 0.09% and China's Shanghai Composite is lower by 0.01%. European shares retreated in early trade. The rupee was trading at 64.17 against the US$ in the afternoon session. 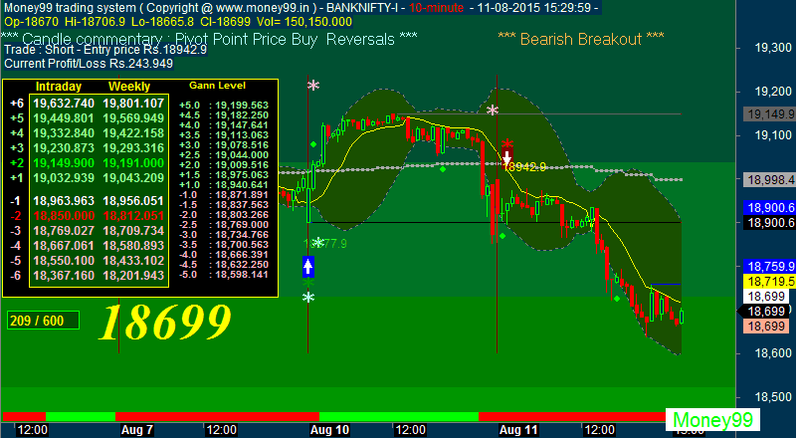 BANKNIFTY closed down -258.100 at 18,616.900. Volume was 35% above average (neutral) and Bollinger Bands were 20% narrower than normal. 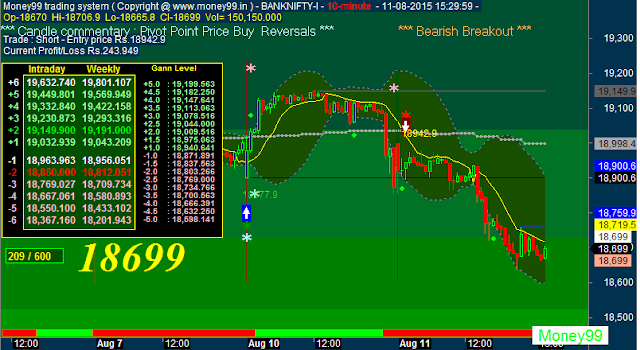 BANKNIFTY is currently 0.9% above its 200-period moving average and is in an downward trend. Volatility is relatively normal as compared to the average volatility over the last 10 periods. Our volume indicators reflect volume flowing into and out of BANKNIFTY at a relatively equal pace (neutral). Our trend forecasting oscillators are currently bearish on BANKNIFTY and have had this outlook for the last 7 periods. GOLDBEES closed up 44.100 at 2,314.300. Volume was 204% above average (trending) and Bollinger Bands were 50% wider than normal. GOLDBEES gapped up today (bullish) on heavy volume. Possibility of a Breakaway Gap which usually signifies the beginning of a major market move. Four types of price gaps exist - Common, Breakaway, Runaway, and Exhaustion. Gaps acts as support/resistance. GOLDBEES is currently 5.2% below its 200-period moving average and is in an downward trend. Volatility is extremely high when compared to the average volatility over the last 10 periods. There is a good possibility that volatility will decrease and prices will stabilize in the near term. Our volume indicators reflect moderate flows of volume out of GOLDBEES (mildly bearish). Our trend forecasting oscillators are currently bearish on GOLDBEES and have had this outlook for the last 53 periods.